I'm headed to the beach this weekend for a bachelorette party for my sweet friend and I'm ready to get some sun on my pasty white skin. This weekend snuck up on me a little bit so I had to scramble to pick up a few new swimsuits. 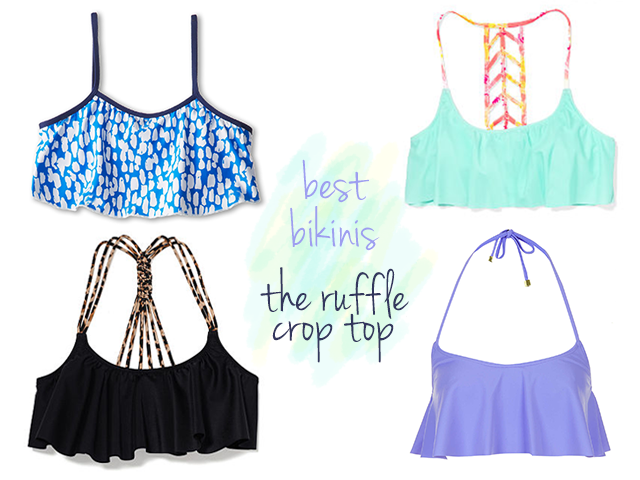 While browsing, I noticed this crop top ruffle thing is all the rage. I'm stoked because I think this style looks adorable and especially helps to enhance us "less fortunate" ladies. Luckily, Zappos saved the day with their awesome 1 business day shipping policy. I was able to scoop up a few suits from my current favorite brand, Splendid, which quickly arrived on my doorstep. I was thrilled try on this suit and matching bottoms as well as this one which offers two different top styles (this and this). I ended up settling on the both styles but had to forgo the second crop top (overkill). This style is definitely a winner in my opinion. Excited to rock these suits this weekend. While I'm at it, I'll also mention I'm loving this style from VS as well as the ever popular bustier style as well.